Earlier this month another volunteer named Christine, started a micro-finance project in one of the smaller rural towns in which we currently have a feeding project. She had to leave and asked me to take on the project for the rest of the time I am here since she knew I was aware of the goals of the project and the reason for starting it in the first place, etc. I agreed, so we have had 2 weekly meetings since that time. We do not have a meeting this week, but will have the first official start to monthly meetings next week. For the first week I simply introduced myself to the ladies and assessed what part of the stage they were in as far as planning and understanding. The meeting last week was a bit more structured as we made decisions about offenses and penalties based on the rules on which they had previously decided. I also had made a chart for them to see a projected savings budget. From 5 different categories of daily savings up to what they could be saving yearly from that same daily amount. I also provided them a chart to see the amount they would be able to ask for a loan based on those same savings projections. After 4 months for the emergency loan and after 6 months for the income generating loan. They asked me to make and bring copies for each of them at our next meeting so I hope that will help them be encouraged to save more! Our first monthly meeting starting in January will be the first enactment of penalties if any rules are broken as well as a discussion about goal setting. I have quite a bit of preparation to do for this meeting, but since it will be the last one I am here for I want to make it count and hopefully convince the ladies it is a wise decision for each of the to choose a goal and for them to encourage each other to save so they are all able to achieve their goals! I am excited to have a finalized list of the group members as well as to have the ability to encourage the ladies to keep up the great work of saving each month! I know this can be a successful project and hope one day down the road they are continuing on with the project on their own! 🙂 Thankful that the Lord knows who needs to come to keep up the good positive growth in this community and to keep the ladies encouraged in this new venture of learning to save and investment in their futures as well as the future of the community! Also back on the 10th of the month I started a cooking class for the Nanay homestays in Bliss. I have taught cooking before and my own Nanay and Kuya seemed excited to learn some different things so I thought it might be nice to open it up to other homestays. I had a pretty good turn out for the first class. The second was smaller, but still a decent amount of people showed up! We took a 2 week break because of the holidays and the center not being open for Christmas Eve and New Years Eve. I will have 2 more classes in January before I leave. The preparation for cooking class has been large. I have to decide what to teach, convert recipes, type up and print copies for everyone who will be attending, make a list of needed supplies both food and actual utensils and go and buy any ingredients/utensils needed for the class. The recipe work alone takes up several hours of a day, but so far they have been happy with the outcome of the recipes! That makes all the work worth it! Over this next week while I am wrapping up my time at the women’s shelter and celebrating New Years I need to prepare for my last 2 cooking class and the micro-finance meeting. Also each week at the women’s shelter I have been teaching a cooking/baking recipe once a week, watching a movie, and either teaching an English lesson, doing a craft, or coming up with a 3rd activity, so I’ve been a busy lady! 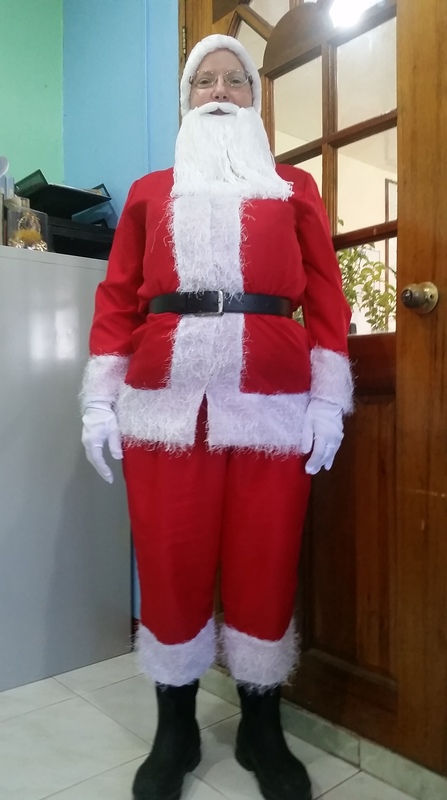 Then last week on Monday I was Santa Claus at the Women’s Shelter’s request for their Christmas party! 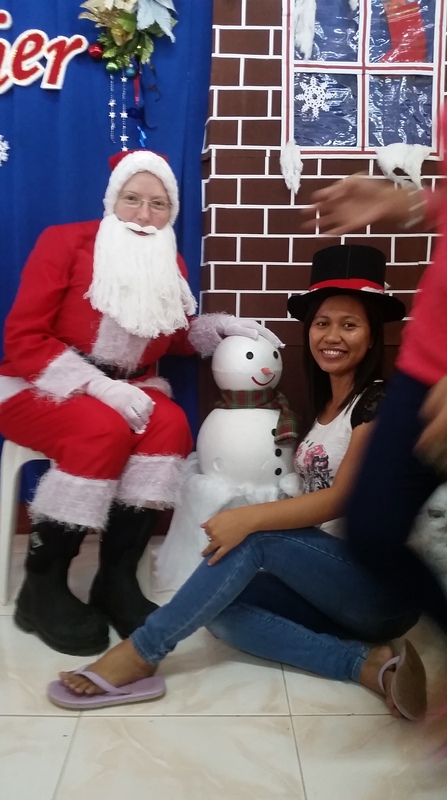 It had been alot of preparation and planning, but paid off well as the children were very happy to have Santa there even when they realized it was me. 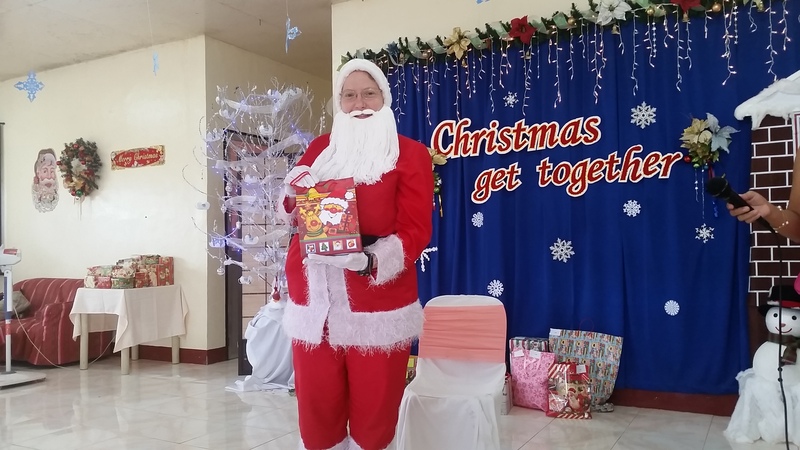 😉 I do have to admit it was a bit awkward at times as they asked me to give out many presents that weren’t mine, but it was also very rewarding to see smiles on the kids faces! I do have a few photos. I am not allowed to post any with the kids but will try to include a couple of me in the costume for you all to have a good laugh at. 😉 As my time winds down quickly at the shelter it seems quite crazy to think I’ve been working there over 2 months already. I hit the 2 month mark last weekend. My time here in the Philippines is quickly dwindling down. There are only 3 of us left that have been here longer than 2 months and soon there will be only 2 because one is leaving on Tuesday. The 2 of us still left will leave within days of each other around mid January. In January, I switch over to working at the center in Bliss and will be an assistant to one of the staff while there. I have no idea what variety of tasks I will be completing at that time, but it will be in addition to these 2 additional projects I am working on. Staying up late has always been my preference to early mornings so I’ve been spending some long evenings preparing paperwork on my laptop, hence the reason I haven’t posted a blog recently. I hope it is not so long next time, but hope you enjoy these updates even though they are coming all at once. 😉 Again hope each of you had a wonderful Merry Christmas and have an amazing New Year celebration as well! All dressed and waiting for my que to go surprise the kids! The staff who worked with me the most to help with translating when needed. y Ie Your church family is praying for you. work you are doing and your willingness to give of yourself that others may learn and improve their own circumstances. God bless you as you continue to work for His glory. You caught everyone up on what is keeping you busy! It is good for them to be aware of all of your activities. You make a good looking Santa. This brought a lot of happiness to the children. It shows that you are a good sport, too. We love you and continue to keep you covered in prayers.